Lynn Riggs; photo © The Lynn Riggs Memorial (all rights reserved; used by permission). 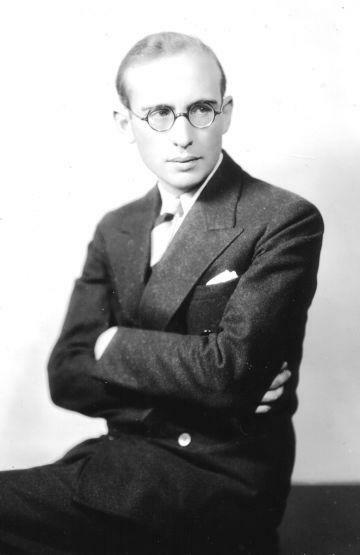 Poet, musician, dramatist, scenarist and director Lynn Riggs (1899 - 1954) wrote 21 full-length plays, numerous short stories, poems, and even a television script before his untimely death at 55. Then-Governor Johnston Murray sent an Oklahoma flag to drape over his coffin (the first time in Oklahoma's history this was done). The Rogers and Hammerstein musical "Oklahoma!" is based on Riggs' play "Green Grow The Lilacs." "Like his Claremore townsman, Will Rogers, Lynn's strength lay in being his own natural self. Lynn wrote about people he had known, entwining their foibles, weaknesses and strengths, their garrulous chatterings and grass-roots wisdoms throughout his plays … Both were unique and both were great Oklahomans and great Americans." Legislation also designated The Oklahoma Historical Society as "the official depository for such articles, papers, script and other materials and items as may be donated to the state by the Lynn Riggs Players of Oklahoma, Inc., for advancing the cultural and educational heritage of Oklahoma." 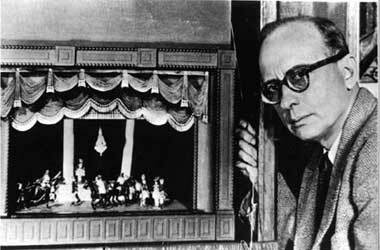 Lynn Riggs used miniatures to stage his play setups; photo © The Lynn Riggs Memorial (all rights reserved; used by permission).